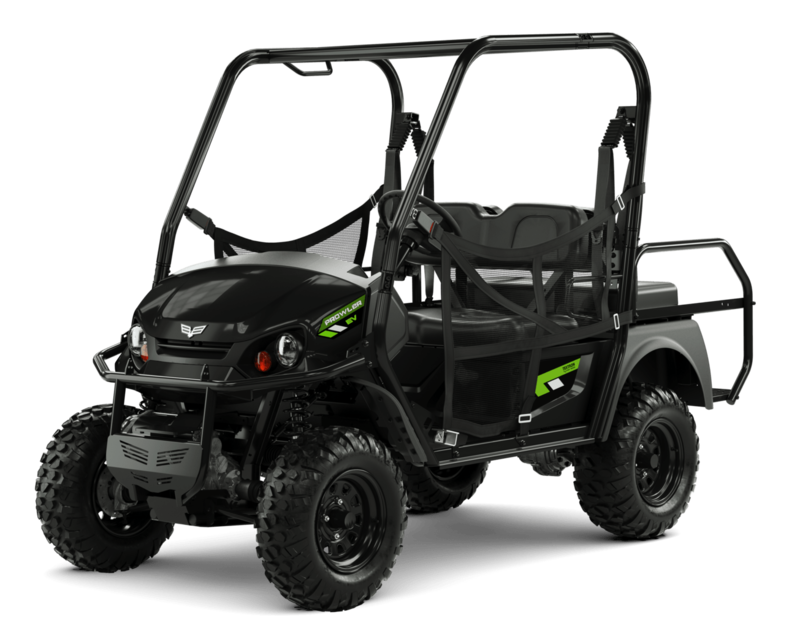 Powerful, stealthy and eager to handle large loads and rugged off-road conditions, the new 2018 Prowler EV and Prowler EV iS from Textron Off Road deliver premium electric vehicle performance for a full range of riders. Each Prowler EV is powered by a 72V battery system comprised of six 12V heavy-duty deep-cycle batteries feeding AC electric power to dual front and rear motors. The result is near-silent operation, ultra-low emissions and 25 percent greater efficiency than DC-powered vehicles. That means more time driving and less time charging. 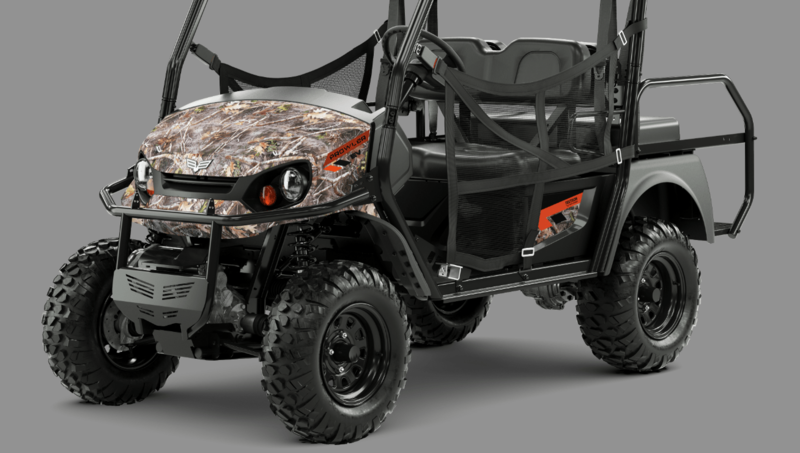 Compared to gas-powered engines, which create a 30,000-sq.-ft. field of disturbance with noise and exhaust, the noise- and emission-free Prowler EV models let you get 85 percent closer to hunting game. Likewise, their silent operation means no noise impact to neighbors. The top speed of each machine is 24.5 mph, with a 16 mph top speed when in the Max Range mode. Regenerative braking extends driving range, while the on-board charging system can recharge the batteries in 8-12 hours. When it comes to off-road performance, the Prowler EV models are ready for it all. Full-time 4WD is paired with fully independent front suspension to deliver serious off-road capability and comfort. The Prowler EV has a solid leaf-spring rear suspension, while the more comfortable and capable independent rear suspension comes standard on the Prowler EV iS. Meaty 25-in. Carlisle Trail Pro tires deliver excellent traction, while four-wheel hydraulic disc brakes provide enhanced braking performance. For added convenience, both Prowler EV models feature IntellibrakeTM – an innovative, automatic Electric Park Brake that’s activated when the driver removes his/her foot from the accelerator pedal. A contoured front bench seat offers comfort for two and is matched by the convertible rear-facing bench seat for four-occupant transportation. And with a maximum towing load of 1,000 lbs. plus a 400-lb. payload on the fold-down rear cargo deck, the Prowler EV models deliver the hauling performance that sportsmen and women demand. A new integrated glove box offers easy access to essential gear. The Prowler EV comes with halogen headlights, while the EV iS model features upgraded LED headlights. 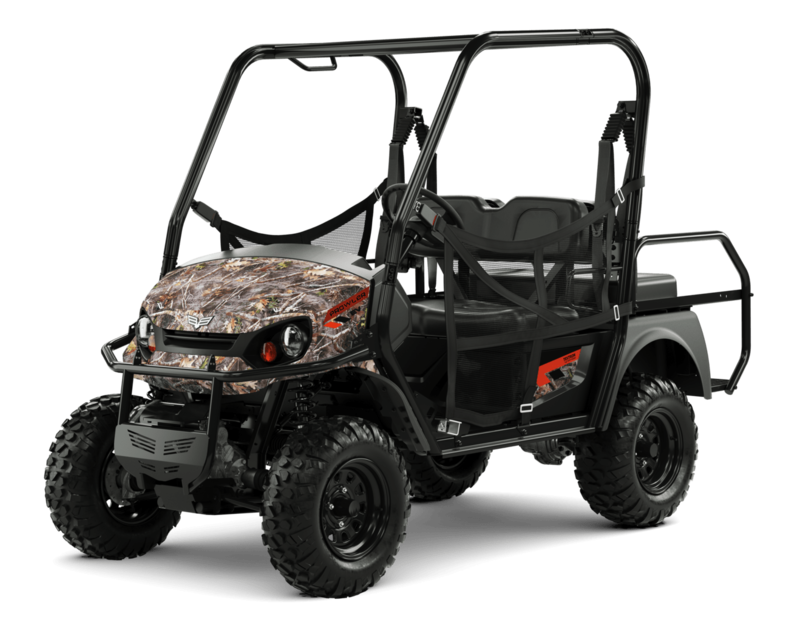 Both Prowler EV models are available in either black or TrueTimber® Kanati Camo and feature an in-dash battery status indicator, a fold-down cargo deck, glove box, 1.5-in. front brush guards, impact- resistant fender flares, a 2-in. (5cm) rear receiver, headlights and taillights. They also come with a 12-mo. warranty.